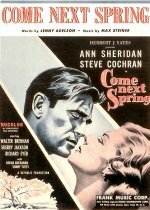 In this heart-warming rural drama, long-absent Arkansas farmer Steve Cochran returns home, cured of his drinking problems and restlessness. He rejoins understandably wary wife Ann Sheridan, daughter Sherry Jackson (who lost the power of speech during one of his drinking bouts) and the son born after his departure. How he regains the love and respect of his family and the community forms the basis of a tale that's told with simple sincerity by director RG Springsteen. It's better than it sounds, and there's the bonus of solid support from Walter Brennan as a sharecropper.